The development of natural resources can be a motor for inclusive development with tremendous benefits for social and economic development of the people living in resource rich and consuming countries. The key element is good governance in the natural resource sector. In many countries the infrastructure development driven by natural resource ventures are of prime importance. This includes major physical infrastructure (such as railways, roads, ports, pipelines, power generation) and its integration into the general economy, as well as social infrastructure (schools, hospitals, community facilities). This development, however, is all too often designed to serve the specific interests of the resource operators. The focus is often put on fiscal regimes, the payments of investors to host-governments in the form of royalties, taxes, dividends, bonuses, etc. While important for sharing the benefits and risks of concrete ventures, this approach neglects a whole universe of other dimension to sound development required to achieve maximum benefits for all citizens. The informed consent of local communities is often elusive, even though it is essential. Sound resource development includes protection and rehabilitation of the environment, including provisions for the closure of mines, once exhausted. Therefore, the participation of civil society with government and business in designing and implementing an enabling environment is essential. Economic and sector management have to be adjusted for optimal impact. In this respect, the Resource Center encourages support for upstream and downstream linkages for added value in the country, but also diversification (“horizontal linkages”) to reduce the impact of volatile resource prices. Human resource development, job creation and capacity building have to be supported by sound policies. Establishment of sovereign wealth funds can help to counteract the “Dutch Disease” and support inter-generational justice. The HUMBOLDT-VIADRINA Governance Platform’s Center for Natural Resource Governance encourages and promotes transparency, participation and accountability in the resource sector. The conceptual framework for this work is the Natural Resources Charter (NRC). 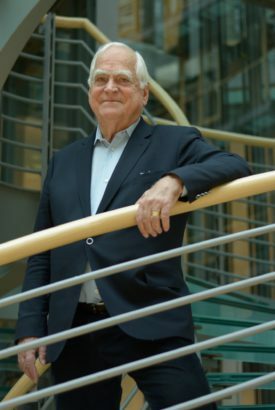 Peter Eigen, lead of the Center, is a member of the Advisory Council of NRI. There is therefore a close strategic partnership between the NRI and HUMBOLDT-VIADRINA. The Center aims works towards a holistic approach to extractive industries development, including the whole spectrum of all elements of its enabling environment: ranging from its social and human development impact, environmental issues, infrastructure development, secondary linkages (processing, associated activities and diversification), fiscal arrangements, international trade. The Center supports resource-rich countries and their governments as well as societies in the sustainable management of their resources. The focus is on economic growth, the promotion of the well-being of the civic population and ecological sustainability. Numerous developing countries carry out complex contract negotiations for large projects, e.g. Raw material extraction and infrastructure projects. It is in the interest of both governments and investors / contractors that these contracts are fair and transparent, as well as being flexible enough to respond to changing conditions. This increases the likelihood that they will remain stable in the long term and reduces the likelihood that they will lead to conflicts. Although the terms of these contracts are critical, the countries often lack the necessary negotiating capacity to achieve the best possible conditions for both sides. Against this backdrop, the HUMBOLDT-VIADRINA Governance Platform* (Berlin, Germany) and the Columbia Center on Sustainable Investment (New York, USA) have initiated a process with the aim of extending expert support globally for these complex negotiations. *The initiative was launched by the former HUMBOLDT-VIADRINA School of Governance. The HUMBOLDT-VIADRINA Governance Platform will continue the work of this initiative.